I am excited to partner with Oak Meadow today to bring you this post all about helping children learn to read! I have been fascinated with how children learn to read for a very long time. My daughter learned to read lickety split without me truly ‘teaching’ her. I have worked with hundreds of students in the classroom and watched some struggle with reading and others pick it up as if it were as easy as could be. My last full year teaching I worked in a specialized class for students with learning disabilities. I was so intrigued by how difficult learning to read had been for these children! When I taught them they were all 10-12 years old and most were at the very beginning stages of reading. I decided I needed to know more about teaching children to read. I completed 3 separate courses at a local University to earn myself the title of Reading Specialist within my school board. I learned SO much and for the first time felt confident in my abilities to teach any student to read. 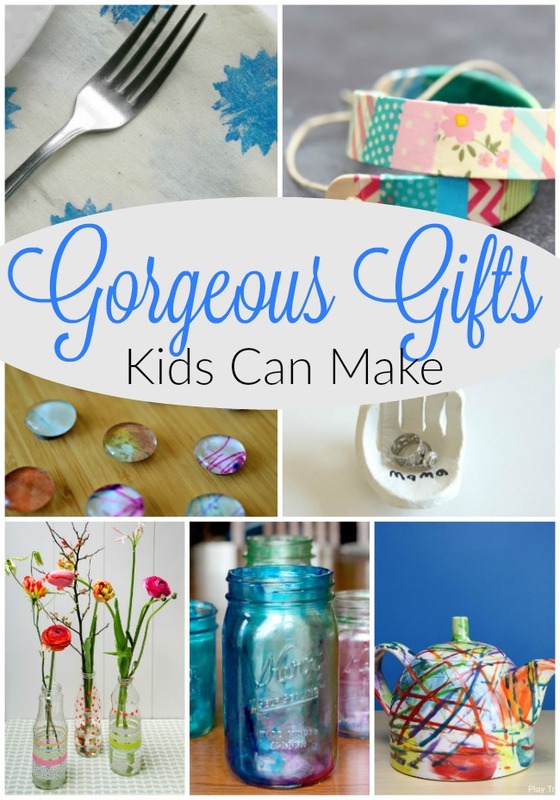 Then, we made the decision to homeschool our youngest two boys. 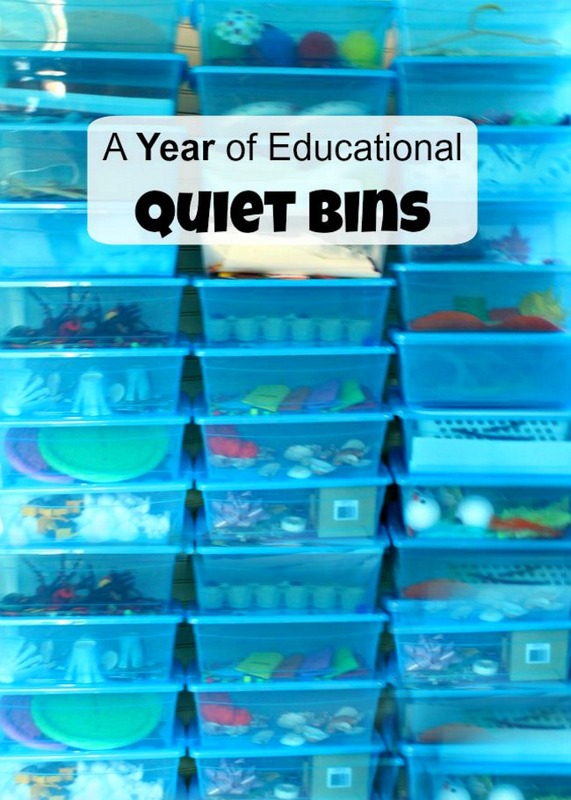 I had taught classrooms FULL of children, including some with incredible learning challenges. I knew I could educate my two lovely, typically developing boys at home. It would be a dream. Anyone home with their children knows that my view on what homeschooling would be like was far from my reality. Homeschooling is the hardest teaching gig I have ever had. But, it is also by far the most rewarding. When it came time to help my oldest son learn to read I was so excited! Reading is such an exciting journey for a child to take, and I got to take it right alongside him. We used our Oak Meadow Curriculum for the First Grade to guide us. I was loaded up with easy readers. I was READY! It wasn’t long before my excitement turned into pushing which turned into frustration for both of us. How could this be? How could my own son, who was being taught one-on-one with a certified Reading Specialist NOT be ready to learn to read when he was supposed to be? Oh the learning that comes with homeschooling. I turned to our Oak Meadow Curriculum and heeded the advice to wait. Read to him lots, play with word families and easy readers, and give him time. My little guy did not learn to read in grade one. He didn’t truly learn to read in grade two either. And to state this was a challenge (FOR ME!) is an understatement. But this summer, right before our grade three year started he began to read. And not just a little bit either. He can read anything. He is devouring chapter books, often reading an entire book in a day or two. He LOVES it and cannot get enough! He understands exactly what he is reading and he is using all of the strategies he had been taught over the years. And, while I truly understand this shouldn’t matter, he is reading above grade level. All of this is to share with you that, when given the experiences and the skills, all children will learn to read in their own time. I truly and wholeheartedly believe this. I am so happy I did not push my little guy to read before he was ready. He now believes reading is amazing and exciting – and I am not sure he would feel that way if I had continued to push him through the stages before he was ready. This year, my youngest son has entered First Grade and we are beginning this reading adventure all over again. We are reading lots, using early readers, and playing with word families. This little guy is eager and excited to learn to read, in large part because he sees how much his big brother loves it, so I believe it will be a rather smooth journey. Today I want to share with you how we use our Oak Meadow Word Families book. I love using word families when teaching children to read. Word families are fabulous for emergent readers as they build their confidence and let them see success nice and quick. Word families are basically simple rhyming words. Let’s take a look at the word family ‘-at’. 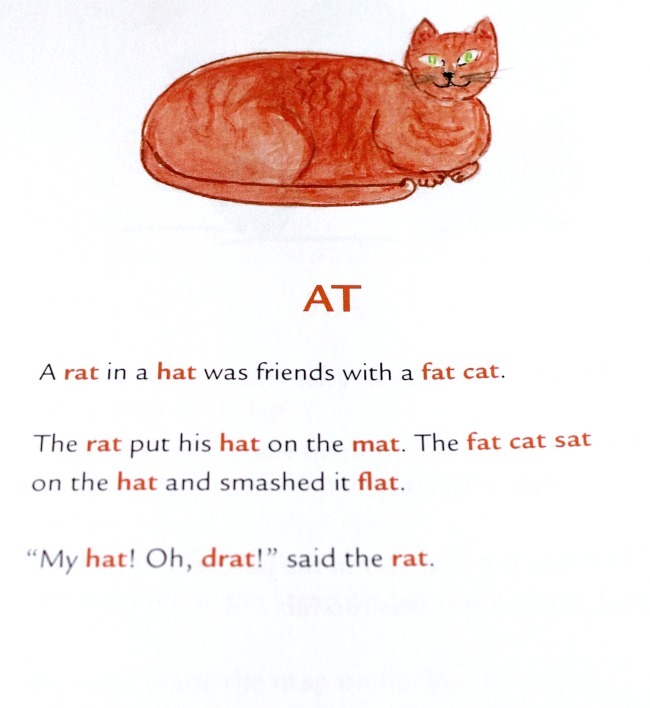 The words in this word family all end with the same letter sounds such as: cat, bat, hat, rat, sat, and mat. The Oak Meadow Word Families book has 40 different word families presented to children in fun little stories. Oak Meadow has based their list on solid research, which I really appreciate. This little book contains over 600 words that children will learn! While there are many, many ways to use this Word Families book, I wanted to share with you exactly how we use it. Each week we focus on one word family. We go through the little story in the book together and point out all of the rhyming words which stand out because they are in a different colour. We read this together a few times and chat about any vocabulary that is new to my little one. The next day, I write out the little story on a piece of paper or the chalkboard all in one colour. We read the story together once more from the little Oak Meadow book, then my little guy finds all of the rhyming words in the story I have written out. He uses a different colour to underline the word family words. By this point, he is becoming very confident with these words. For the rest of the week, we play games with these words. 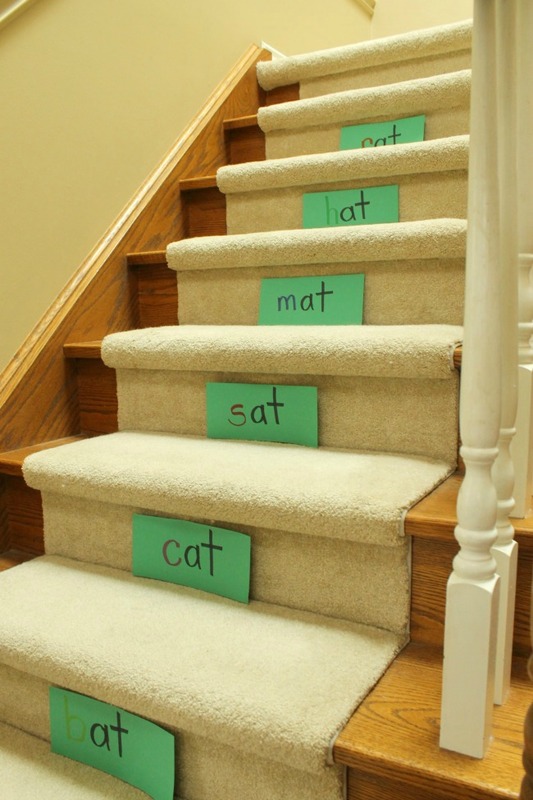 We will write them out on paper and stick them to our stairs to read each time we go up. We will pop them on his bedroom door for him to read before he heads to bed. I like to have him manipulate these words himself my writing one word from the word family on the chalkboard. I might write the word, “bat”. I will give him the eraser and a piece of chalk and say, “change one letter to make this word say, cat”. He then erases the “b” and changes it to a “c”. Once he gets very confident with this, I will even mix it up and get him to change the middle and last sounds as well. So I might put the word, “cat” on the chalkboard and ask him to change one letter to make it say, “cap”. If he is really in the zone, I will even try the middle sound, which is the trickiest! That would be having him change the word “bat” to “bit” for example. We play with the same little story and the same word family for the entire week. It is amazing how quickly he picks up these words. Finally, at the end of the week we copy these word family words into his Main Lesson Book. We also go back and have a look at the words from the previous weeks. 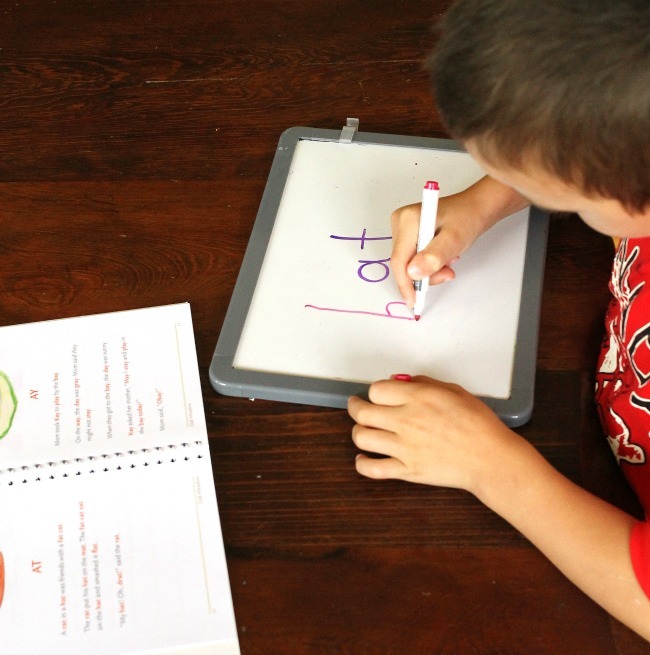 It is so beautiful to watch his confidence soar as he can easily read more and more words! 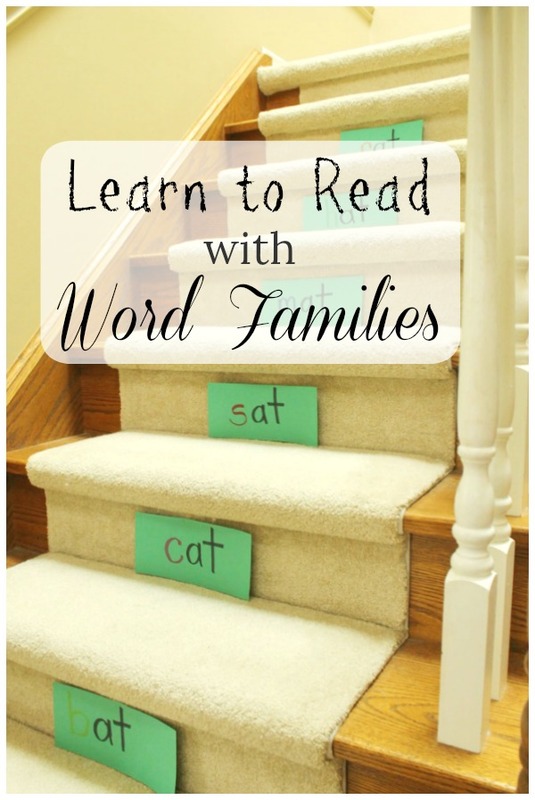 There are endless ways to play and learn with word families and they truly are a fabulous way to introduce reading to little ones. 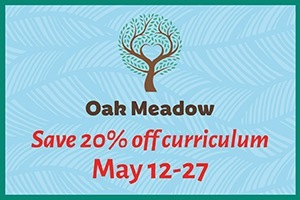 I want to thank Oak Meadow for partnering with me on this post. If you are interested in having a peak at the Oak Meadow Word Families Book you can find it in their Bookstore. We received ours as part of the grade one curriculum bundle. If you have any questions about helping your little one learn to read, please leave a comment below and I would love to support you if I can. Learning to read is such an incredible journey! Thank you so much for reading friends. I hope you are having a fabulous week.